Lightroom 3 Beta released ! 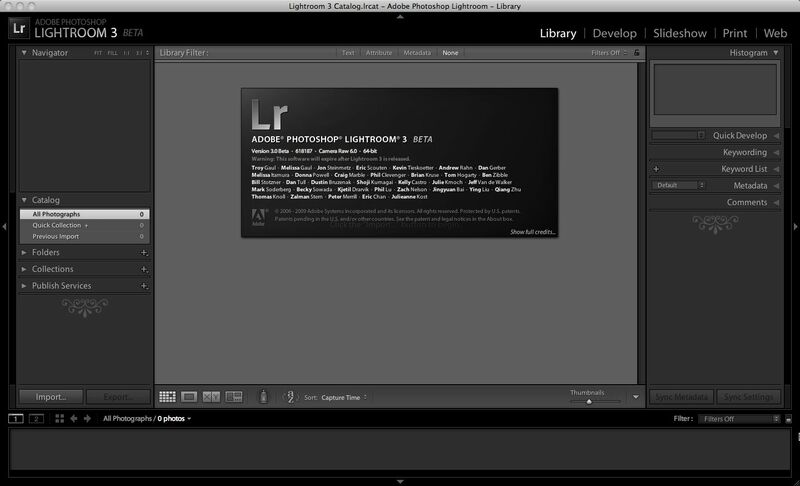 Adobe has released the public beta of lightroom 3. You can download the Public Beta at: http://labs.adobe.com/technologies/lightroom3/ I am running the new Beta and have a few thoughts on what is new and improved, what works and what doesn’t. The first thing is the new and hopefully improved Import Photos program. This first thing is that the interface has been changed drastically. He new import photos window pops up in the middle of the screen. It seemed faster. Not sure if this was actually true or not but it seemed to be faster. The two finger scrolling used by the Macbook Pros doesn’t seem to work on the previews in the expanded import window. On to the meat of LR3, the same five modules as in the previous versions: Library, Develop, Slideshow, print and Web. Library Module: The first thing that I noticed is that there where a couple of new features over to the left side. These were the ability to publish directly to a disk (think iPhone folder) and the ability to send images directly to Flickr. I love this. I use Flickr a lot and it is always a pain to export the images and then have to upload them separately. This is a great integration, at least for me. I didn’t notice anything else new in this module but then again there was nothing I really wanted to have added to this module. I am sure I am missing something and will write about it when I find out what it is. The only thing I did notice was that the image count was off over in the drive area. 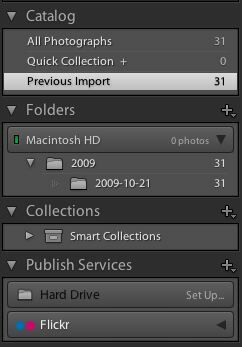 If you look over to the Macintosh HD you see that it has 0 photos while in the folders below it shows 31 images. Well, I know there are 31 images so it is the count in the drive name that is off. Develop Mode: Ok, wow. some big changes here and some really nice new features. The first is that the collections are now available in the develop mode. This means I don’t have to switch between modules to switch between collections. Great addition and a real workflow timesaver. The next thing I noticed was the new Effects panel and the ability to add grain. GRAIN !! Thats awesome. Now, will I use it ? I’m not sure but I do love the option. Right above Grain is the Post Crop Vignetting with new controls that I don’t know yet. So I will assume that these new controls improve the vignetting function and will experiment with them at a later date. There is also some rearranging of controls. The Detail panel now has improved Noise Reduction and Sharpening controls while the new Lens Corrections panel has the Lens Vignetting and Chromatic Aberration controls. Here you can see the difference between the LR2 on the left and the LR3 on the right. Slideshow Module: I used the Slideshow module once in the real world because it just didn’t fit into my workflow but I have read that the new Slideshow module now will create slideshows that can have embedded music. I am definatly going to get back into this mode and see if I can incorporate it into my workflow, but if I can’t, it’s not a big deal because I usually output my images to the web and to print using the next two modules all the time. Print Module: The new custom package lets you create custom print layouts. I’ll let that sink in for a while. Think about it… Custom printing. You can now create wedding books right out of Lightroom without having to create custom pages in photoshop. you can create custom collages, and different sets of images. You can also have different color backgrounds. There is a lot to test and look at in this module. More on the print module soon. Web Module: At first glance I did not notice anything new and improved in this module but i did see all my presets and saved galleries were right where they should be. It will take some reading and research to find the upgrades between LR2 and LR3. Now for the One More Thing, (think Steve Jobs here) Here is the game changer for me. REAL WATERMARKING !! Yup, thats right, real watermarking. 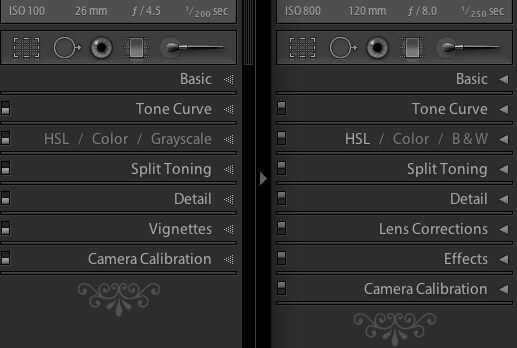 I don’t have to export from Lightroom, watermark my images and import them back into Lightroom. This is awesome !! 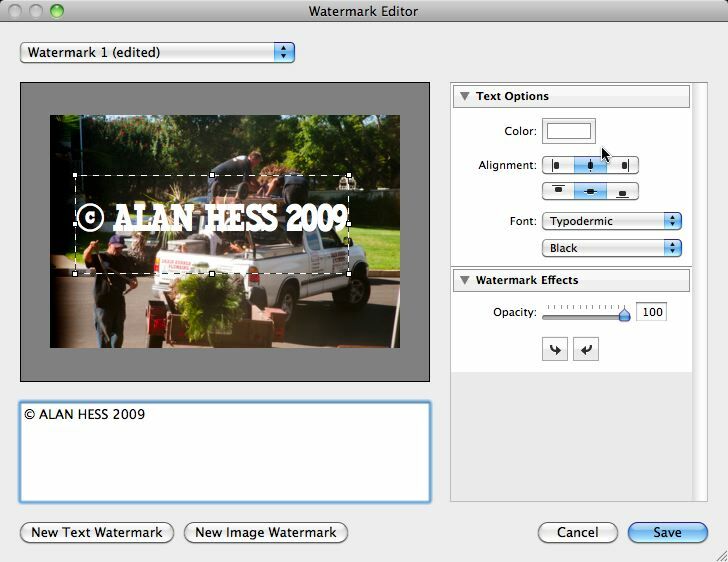 You can finally add a watermark in the middle of an image and control the font, color, size and opacity of a text watermark or use a graphical watermark. I love this, but would like to see a few more controls including a drop shadow, stroke, bevel and emboss, but hey this is a HUGE step forward in speeding up my workflow. Thanks you lightroom team. So there it is. My first opinions on the Public Lightroom Beta. More to come….